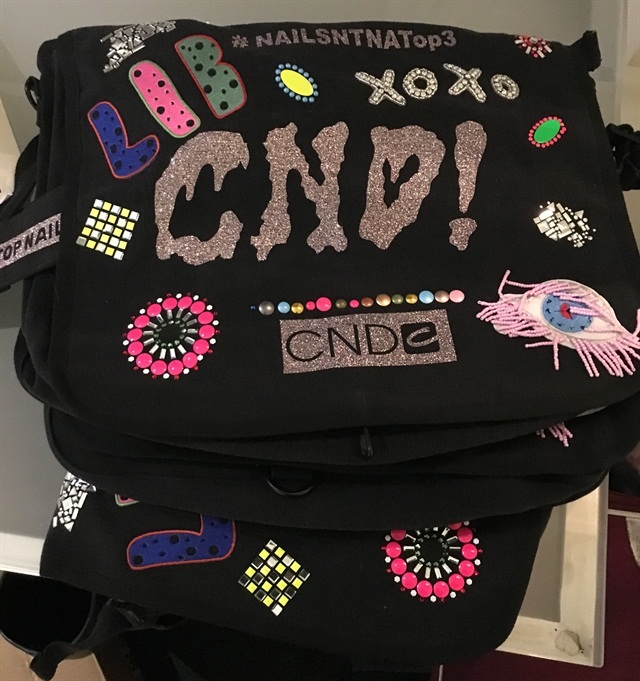 Designer Johnson Hartig created messenger bags specifically for the NAILS NTNA Top 3. It’s no surprise that Johnson Hartig, the designer behind fashion label Libertine, is a fan of nail art. Hartig has collaborated with CND for the past four seasons to enhance his runway shows with over-the-top nails. Last season, NAILS Next Top Nail Artist ended with an homage to Libertine, asking Top 3 finalists Danielle Costantino, Lexi Martone, and Lavette Cephus to create final sets of nails inspired by the label. Hartig even sent them all a video message detailing what he loved about their designs. This season’s NTNA ended on a different note. The final challenge centered around Beauty Changes Lives. But it didn’t stop designer Johnson Hartig from rewarding the Top 3 with a fashionable prize. Hartig created custom messenger bags for Celina Rydén, Sarah Elmaz, and Winnie Huang. The design included glitter, the 3-D eyes Hartig showed at his runway show this past season, and the NAILS NTNA hashtag.The strap had NAILS Next Top Nail Artist written across it to resemble a sash. The bags were presented to the three finalists by CND’s Jan Arnold, NAILS Beth Livesay, and Erika Kotite the Thursday before America’s Beauty Show. NAILS would like to think designer Johnson Hartig for his continued commitment to the NAILS Next Top Nail Artist program.